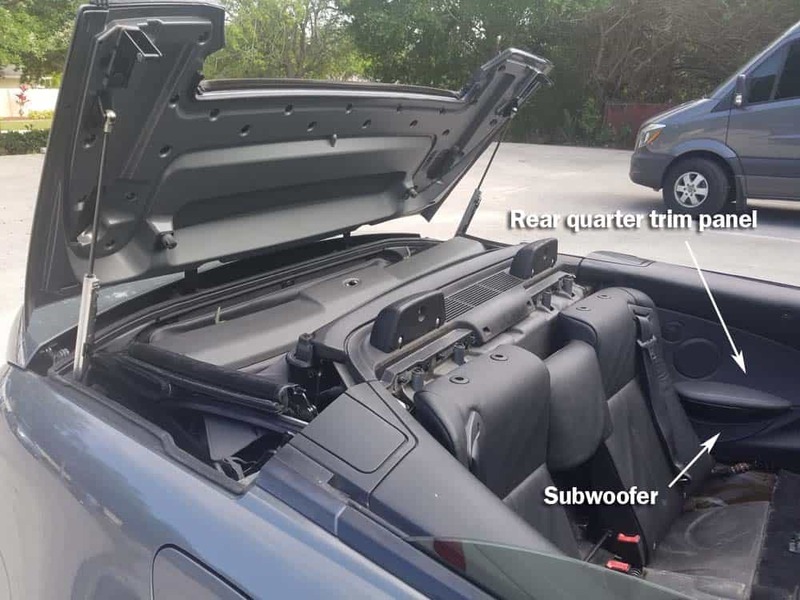 A 6 series subwoofer speaker replacement on an E64 convertible requires removing the rear quarter trim panels. These speakers are known to fail under high use conditions. Yep…it’s all about that bass these days. And even though Meghan is metaphorically referring to her derrière in this song, the words still resonate with most BMW owners…turn up the bass and enjoy the ride. Unfortunately for BMW E64 6 series owners, one of the first speakers to blow are the vehicle’s subwoofers. 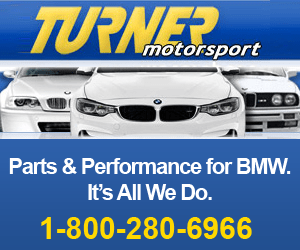 Unfortunately many BMW owners are turning the bass up a little too much. This increased work load, especially on the vehicle’s subwoofers, can cause the speaker’s cone to separate from the surrounding frame producing an obnoxious “rattling” or “buzz”. 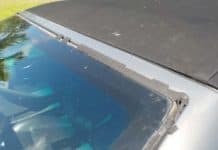 Sometimes the rattling or buzz is so bad, you will need to lower the system’s bass tone settings just to keep yourself from scratching your eyes out. 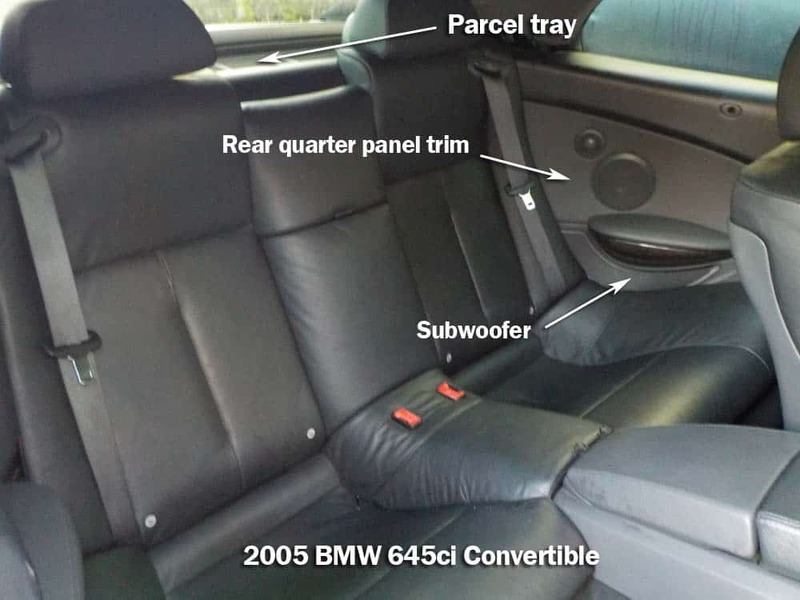 Unfortunately for BMW E64 6 series owners, one of the first speakers to blow are the vehicle’s subwoofers. 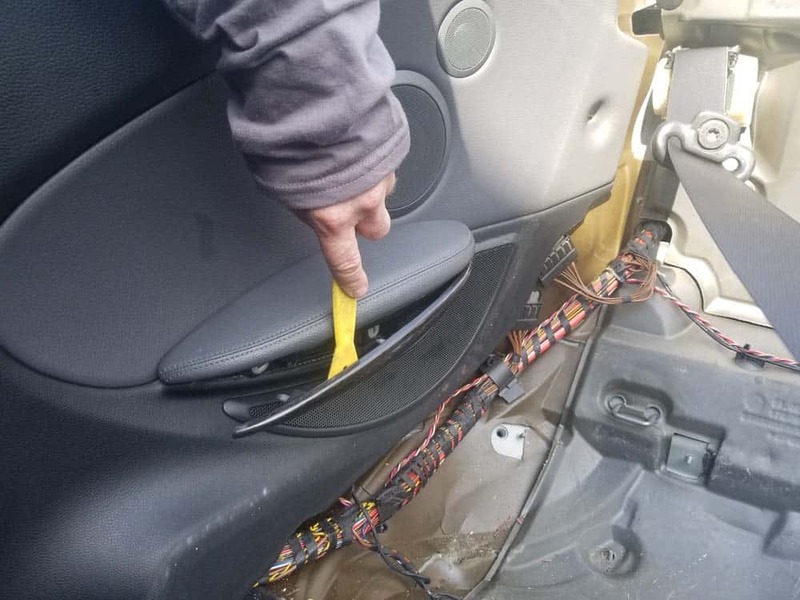 In order to do a BMW 6 series subwoofer replacement, the rear seat must be removed. Believe it or not, this is the simplest part of the of the repair. Just remember in order to do this repair, the convertible top must be retracted and the convertible top lid in the “open” position. 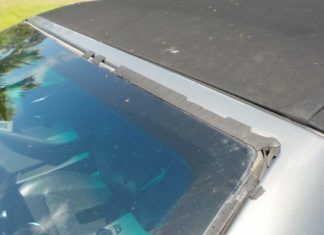 So if you are planning on doing this repair outdoors, make sure it is not going to rain. 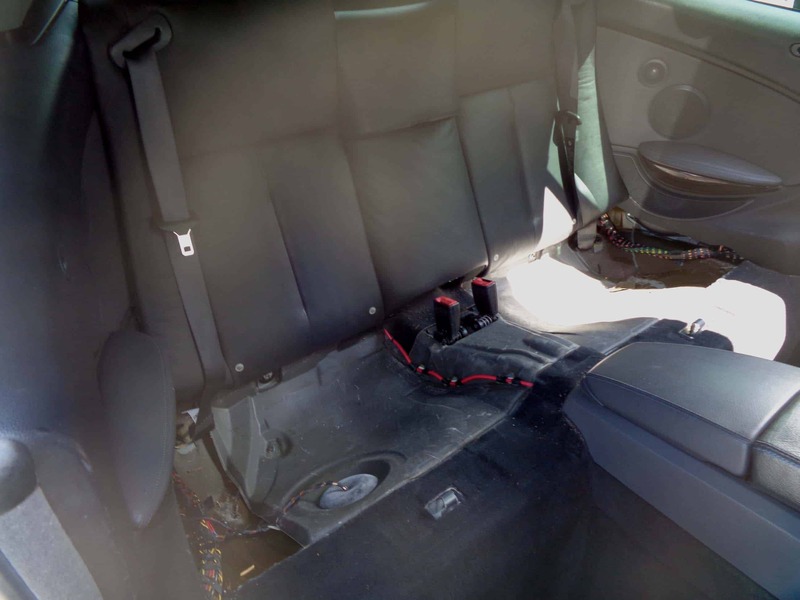 New subwoofers for this model vehicle (E64) are extremely expensive. A new pair will run you about $700 if purchased new from an online supplier. 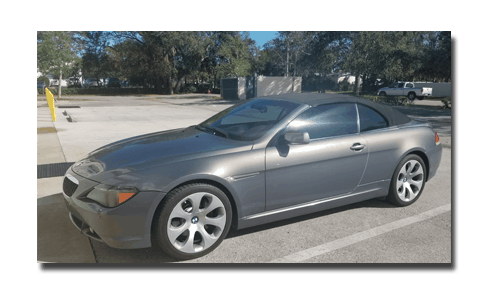 For our BMW 6 series subwoofer replacement, we purchased a used pair off of Ebay for less than $100. 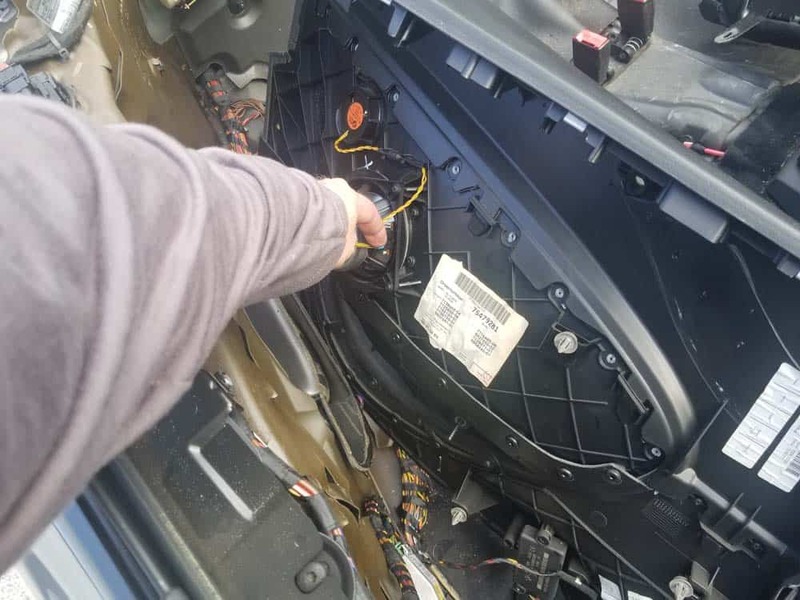 Even though we recognize that was a risky move, we did do our due diligence by contacting the seller who guaranteed us the speakers were in excellent working condition from a low mileage vehicle. It is your call on which route you wish to proceed with when purchasing a new set of subwoofers…but if you can buy a used pair for a fraction of the price of new ones, the reward may outweigh the risk. Retract the convertible top leaving the convertible top lid in the raised position. 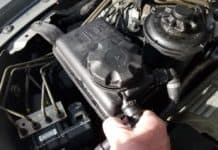 Note that you will need to keep the engine running in order to keep the lid open (it slowly closes automatically with engine off). 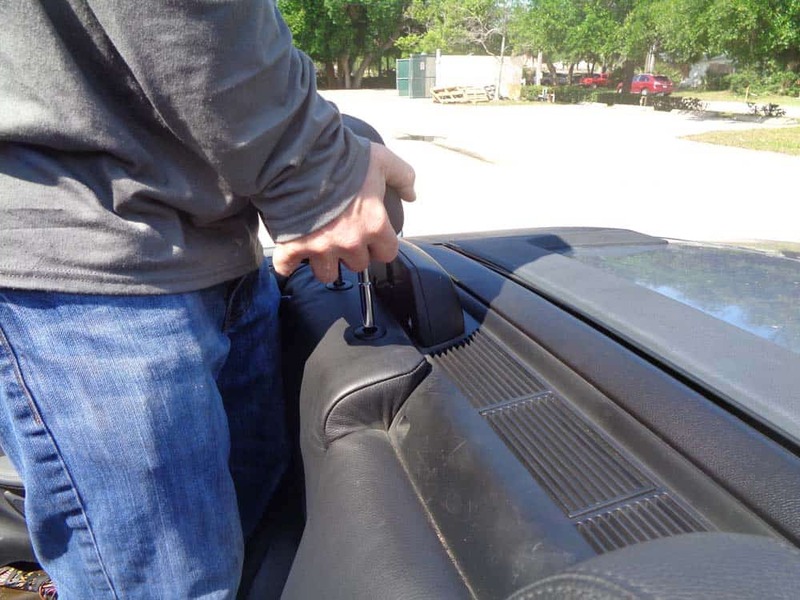 Grasp the front of the rear seat and pull out and up to release from floor of vehicle. 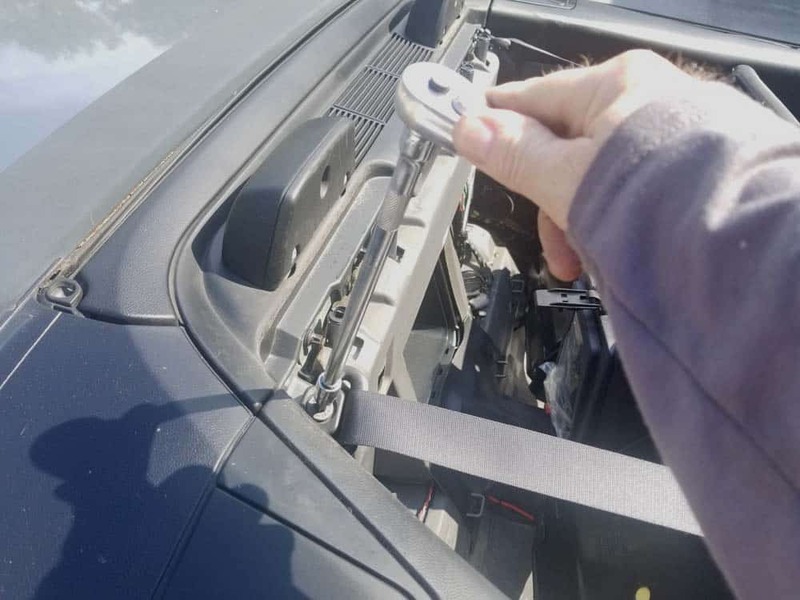 Remove seat from car. 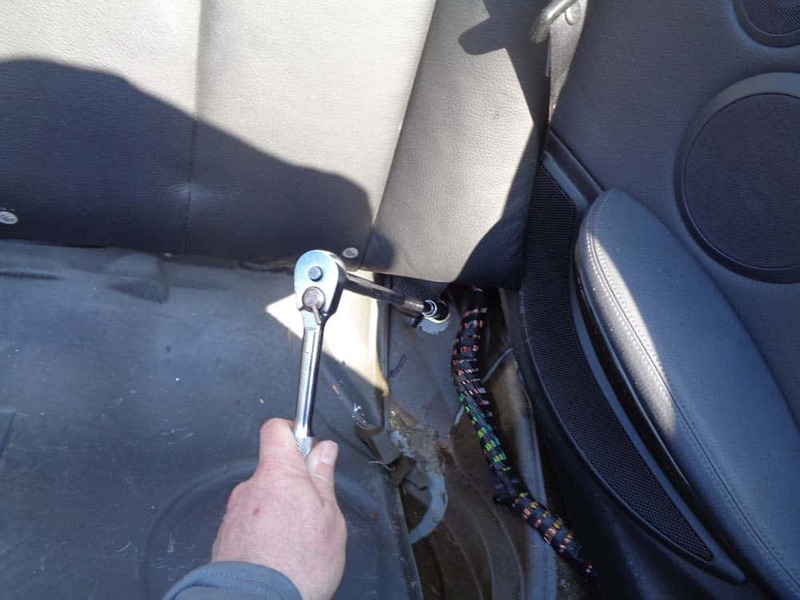 Use a 10mm nut driver to remove the two nuts securing bottom of seat back to vehicle. 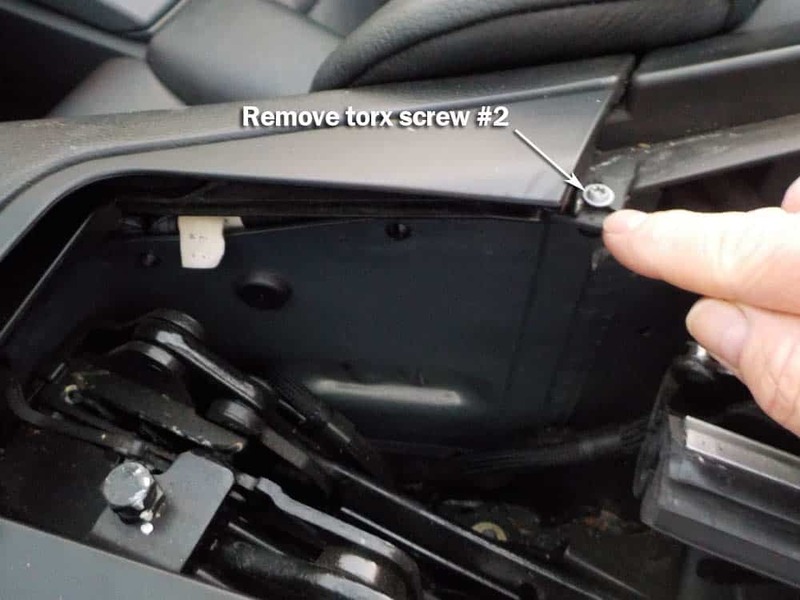 Use a T50 torx socket to remove the two lower seat belt bolts. 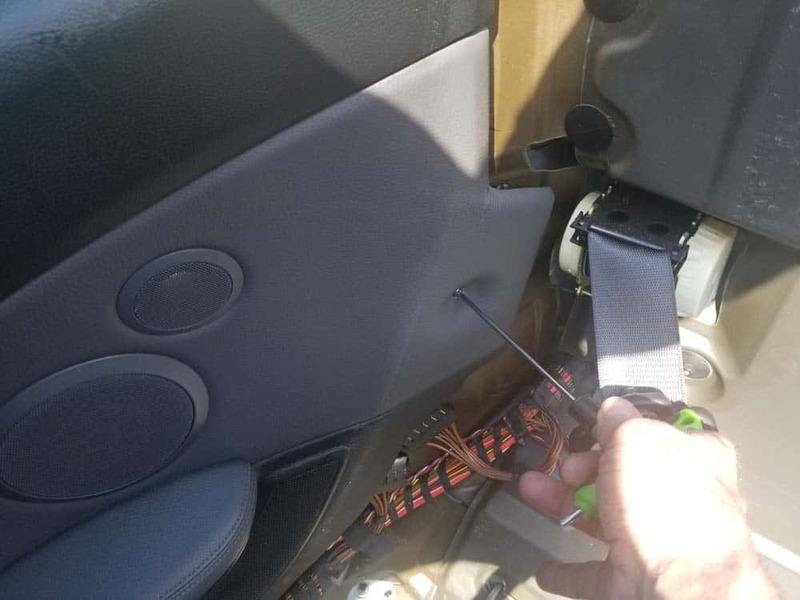 Use a T50 torx bit to remove the two upper seat belt bolts. Pull the seat back out of the way. 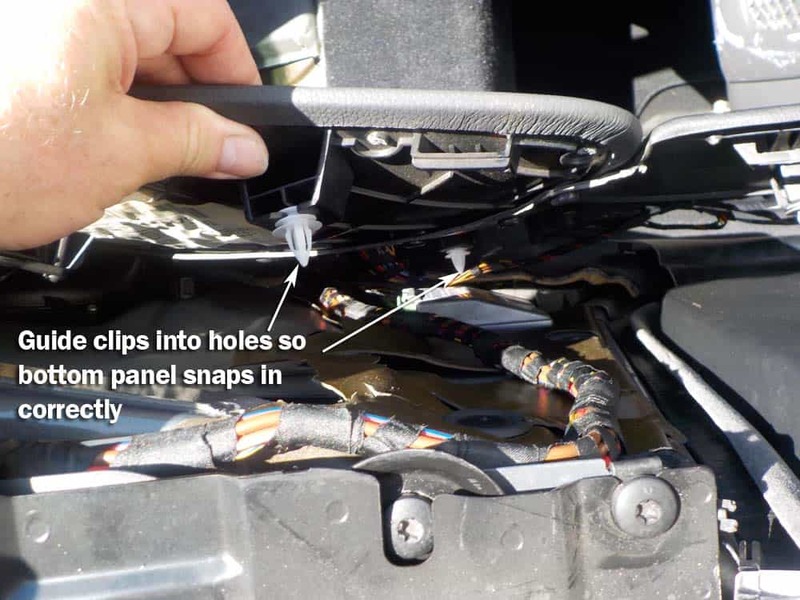 Remove the T15 screw from rear quarter trim panel as shown in image below. 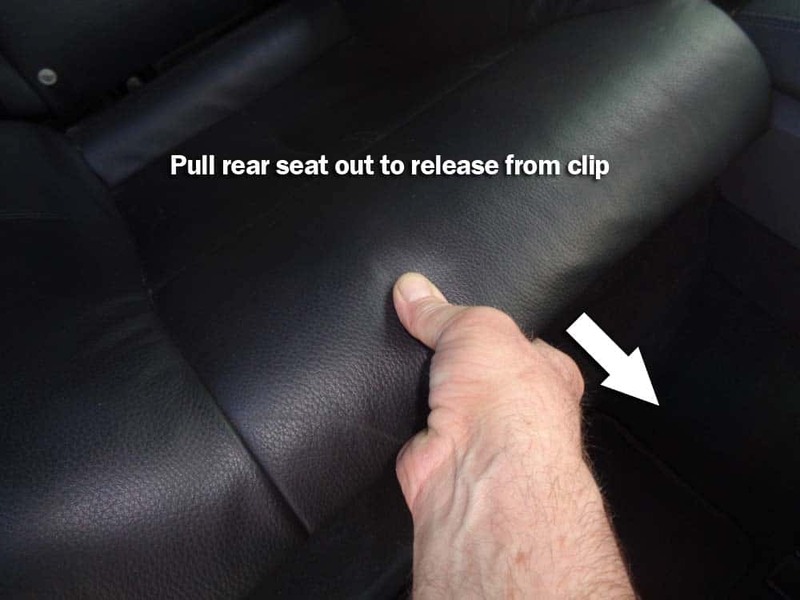 Remove the armrest trim moulding with a plastic trim removal tool. 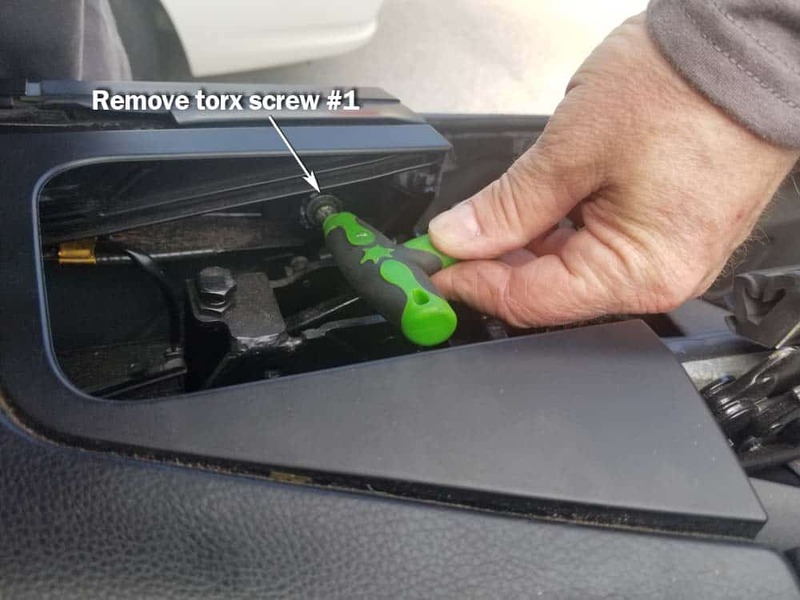 Remove the T15 screw located behind the armrest trim moulding. 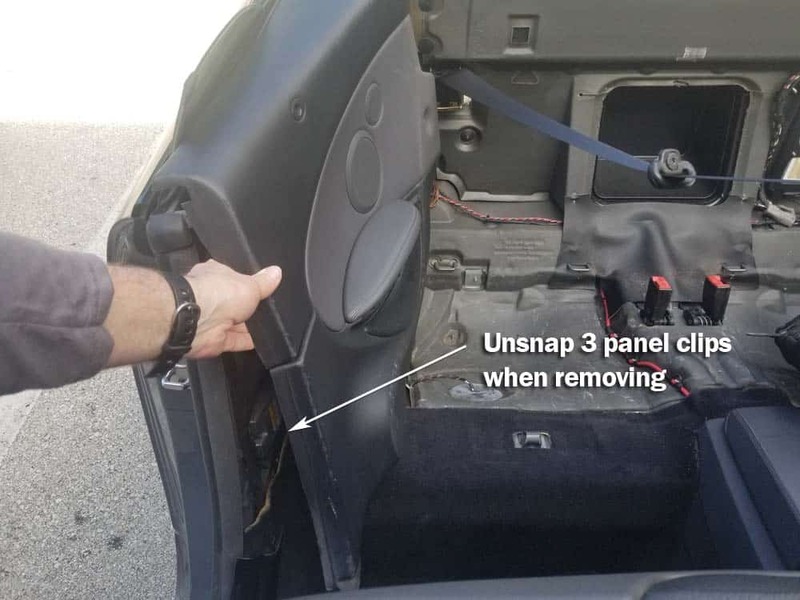 There are two more screws that must be removed from inside the rear cover located at the top rear of the quarter trim panel (see images below). In order to retract the rear cover and access the two screws, the convertible top lid MUST be in the raised position. 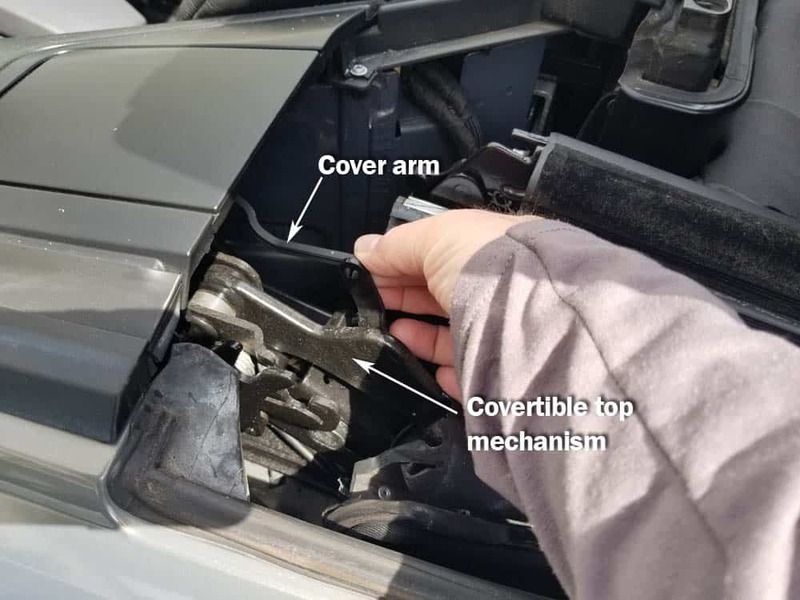 With the lid raised, unhook the cover arm from the convertible top mechanism and pull the cover back (all of this sounds confusing but is very simple…please see images below). 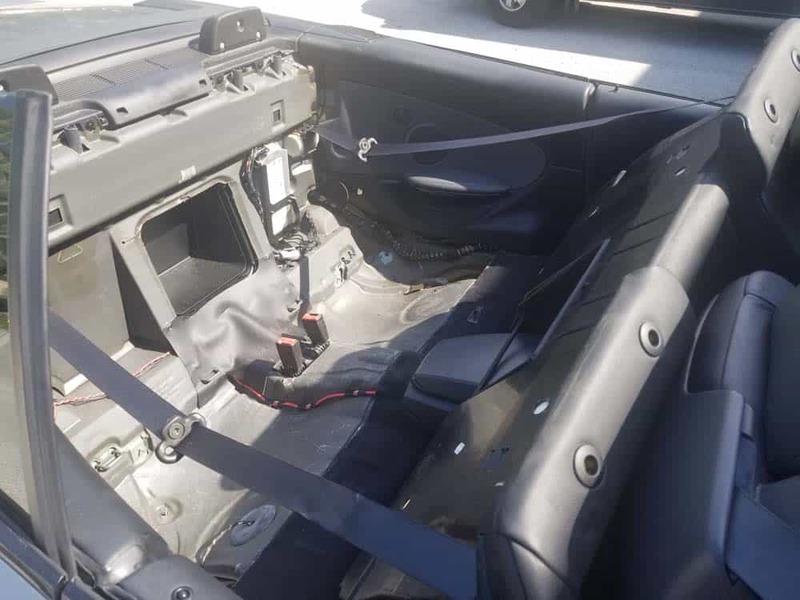 You can now grasp the rear quarter trim panel and remove it from the body of the vehicle. There are three panel clips that will unsnap from body when you remove. 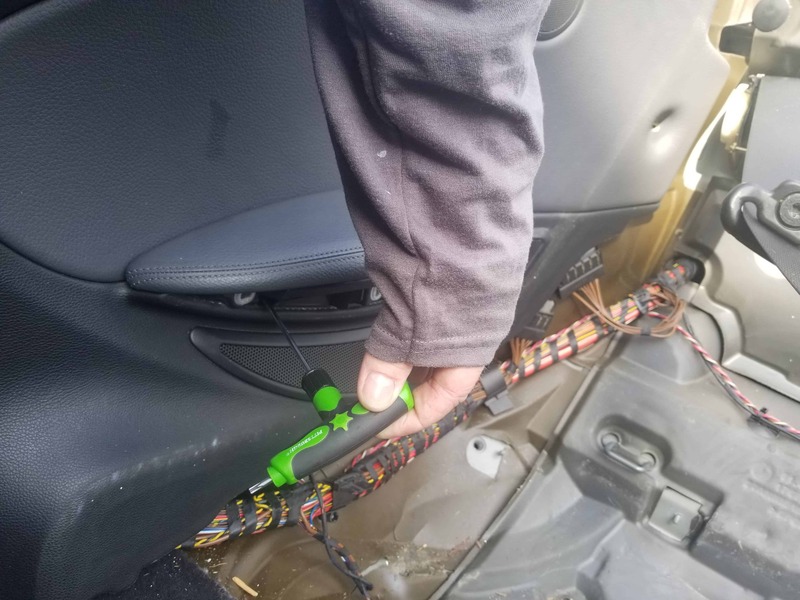 If you break any of the clips (which is completely normal), re-order by clicking this link: BMW door panel clips. Disconnect the speaker electrical connector. 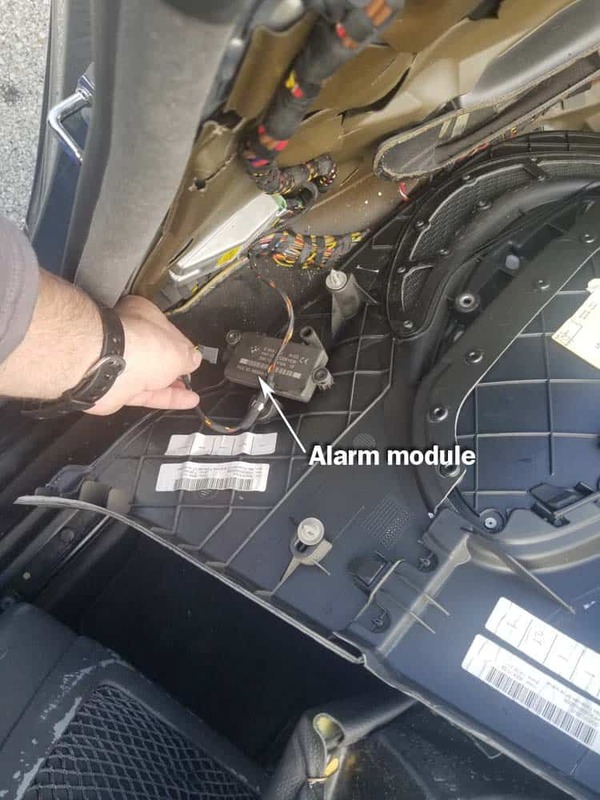 Disconnect the alarm module electrical connector. 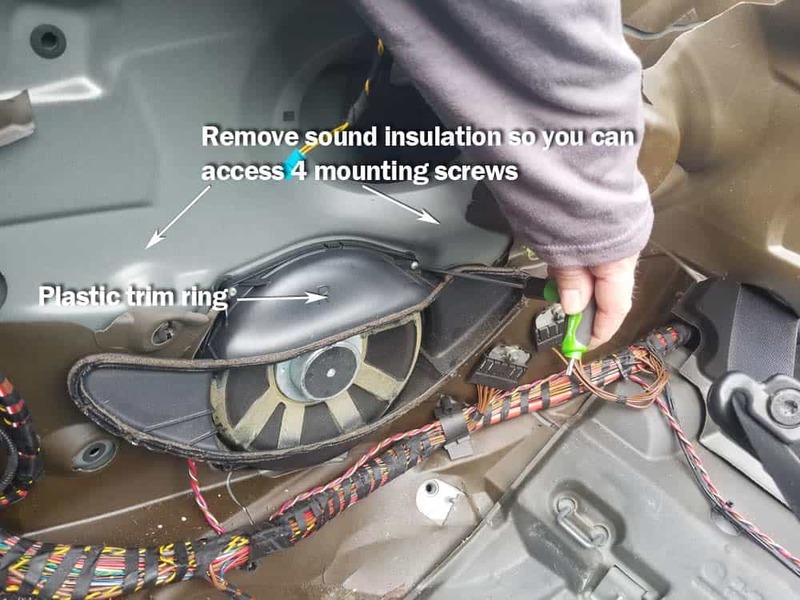 Remove the sound insulation around the subwoofer. 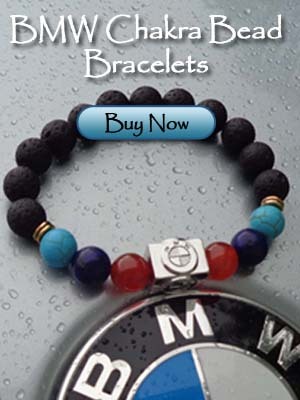 It is most likely very brittle and will just fall apart in your hand. If you wish to replace this small amount of insulation, there are many brands on the market you can use. We didn’t replace our sound insulation and there was absolutely no noticeable difference (see next step with removed insulation). 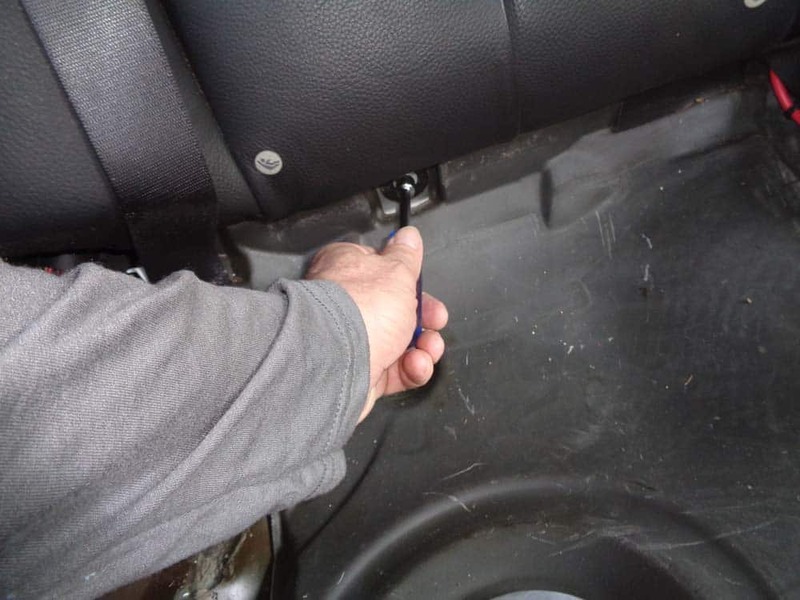 Remove the four T15 torx screws anchoring the subwoofer to the body. 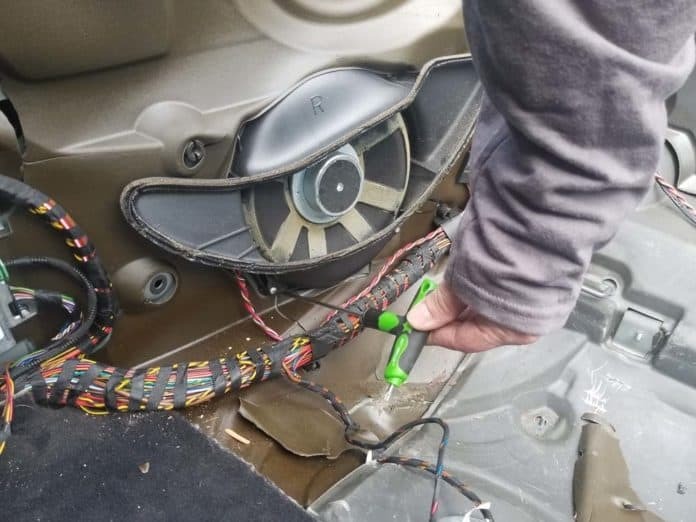 Remove the plastic subwoofer trim ring. 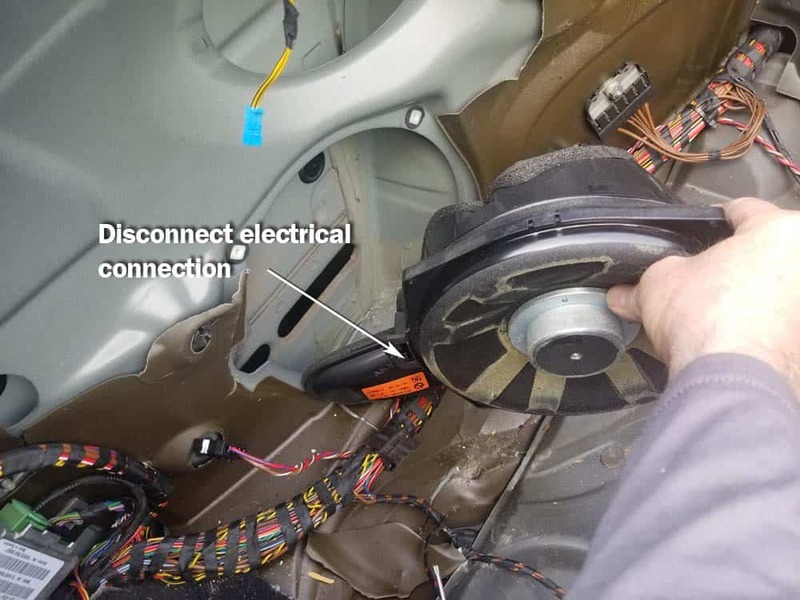 Disconnect electrical connection and remove the subwoofer from the quarter panel. 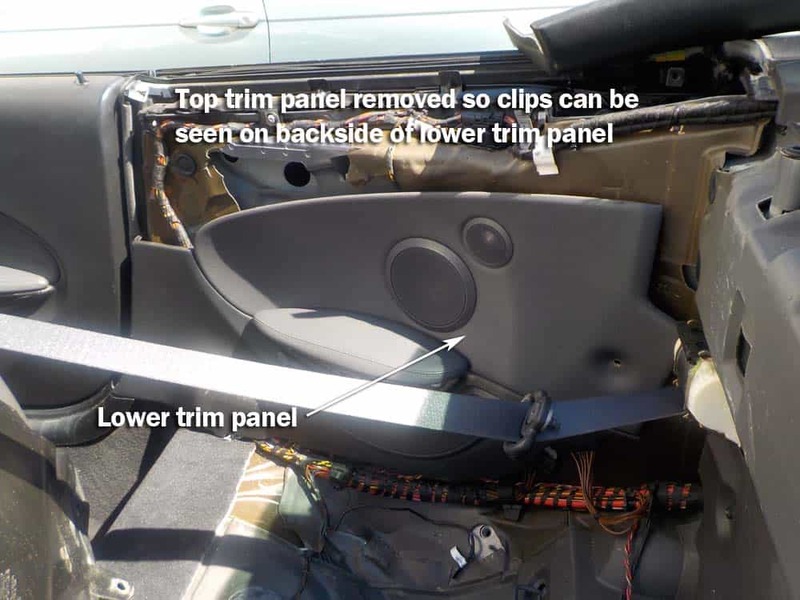 When reinstalling the rear quarter trim panel, separate the top panel from the lower panel first (see image below). 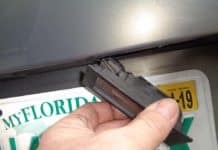 The reason you want to separate the trim panels is so you can see the plastic clips on the lower panel and guide them into the their holes.